In 1-quart saucepan, heat 1 1/2 cups of the broth to boiling. Reduce heat to medium. In small bowl, stir remaining 1/2 cup broth, the flour, salt and pepper with whisk until smooth. Gradually stir mixture into hot broth. Cook and stir until thickened and bubbly. 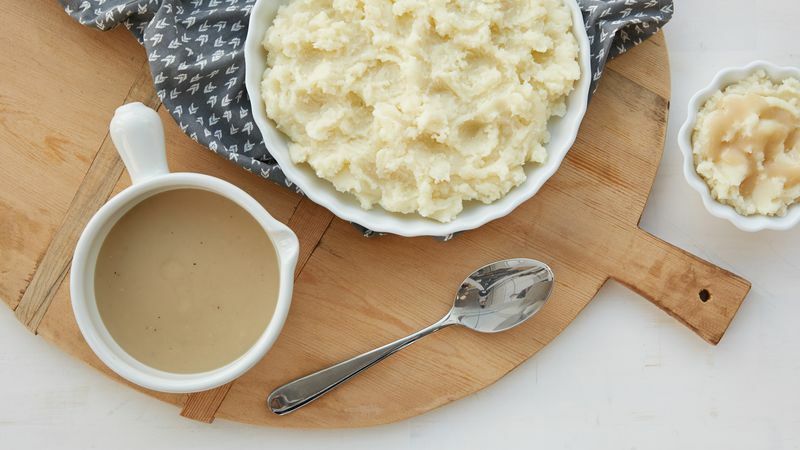 The trick to smooth gravy is using a whisk when adding the flour mixture to the hot stock. For richer color, add 1/2 to 1 teaspoon browning and seasoning sauce. It’s amazing how easy this homemade chicken gravy recipe is! Check out that ingredient list — with just a few kitchen staples and 15 minutes, you’ll end up with a rich and flavorful gravy. Chicken broth serves as the perfect substitute for typical gravy drippings, and the reviews prove that it’s just as delicious. Drizzle it over your favorite mashed potatoes, biscuits or anything else on your plate! Pretty much every piece of comfort food tastes delicious doused in gravy. Speaking of comfort food, how about you explore all of Betty’s chicken recipes for even more delicious dinner ideas?